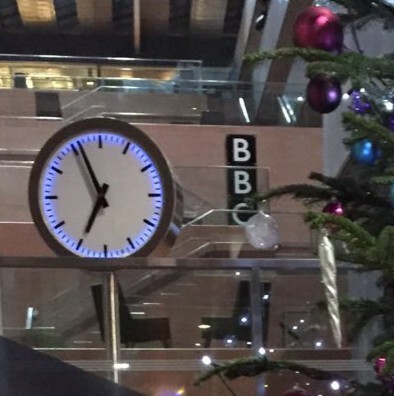 This morning the Creative Fool was alive, awake, alert and relatively enthusiastic about the fact that she was on Thought for the Day at 7.22am on BBC Radio Scotland. Today was slightly different from usual as, having moved to Glasgow at the beginning of December, I was able to do my thinking in the studio with the presenters rather than patched in from a broom cupboard in Edinburgh. The text of what I said is printed below, and you can listen again by following the link and scrolling to 01:21:25. I’ve just moved house and am in the middle of unpacking boxes and learning how things work in the new place. For the first time ever, I know exactly where my Christmas decorations are stored. The annual ritual of hanging favourite tree baubles, coupled with the practical business of settling in, has made me reflect on the importance of meaningful objects and the experience of being a stranger in town. 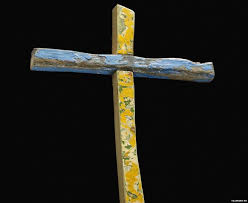 The British Museum, which houses around 8 million meaningful objects has recently been given the Lampedusa cross, a simple wooden artefact made from a ship that sank off the Italian island in 2013. Onboard were over 500 refugees, many of whom had fled persecution. Only 151 people survived and a local carpenter decided to give each one a cross as a symbol of hope. The cross now on display in the museum is not ornate. Made from peeling yellow and blue driftwood its origins as part of the ill-fated boat are evident and yet, with its rough wood and worn paintwork it carries a beauty by dint of its meaning. The Lampedusa cross is a meaningful symbol of our time, and, as we near the end of a year that has seen unprecedented levels of human migration across the globe, it is good to be reminded that hope is the fuel for human endeavour. Christmas is the story of God coming to earth as a human being. The hope of grace born in the frail yet solid form of a refugee baby. And as I’ve tried to work out how to live in a new place, I’ve been struck forcibly by the enormity of Jesus’ incarnation. The riskiness of laying aside the glory of heaven to be born in a stable to a teenage mother and the sacrifice of becoming subject to poverty speak of the lavishness of God’s love for us. Like the Lampedusa cross, the incarnation is not ornate. The reality of God being born into suffering, and ultimately his death on another cross, means that Christmas is a meaningful symbol of hope for all. That’s good news in the midst of the baubles and the boxes wherever you live. That’s me done thinking for 2015, but I look forward to doing more foolish thinking in 2016!